The Sunova Business Cash Back Mastercard is your key to keeping costs low and streamlining your expense reporting. We’ve designed this card to help you earn generous benefits with the support of exceptional member service! The Sunova Business Cash Back Mastercard is all business when it comes to protecting your purchases, with a little bit of fun mixed in. You’ll receive 1 point for every $2 you spend, so you can save some dough or maybe treat your employees. Boss of the year anyone? With multiple cards, you can sometimes lose track of your available credit. We make it easy for you to stay up-to-date on your balance and payments with MyCardInfo, a 24/7 online account management tool. You can also look up past statements, review recent activity, and pay your credit card bill! Shop for your business with complete confidence. Our Zero Liability program offers you protection against unauthorized use of your card – online or in stores! Thanks to some sophisticated technology designed to detect suspicious transactions, you don’t need to worry about fraud charges on your account. If we detect a suspected fraudulent transaction or a potential security breach, we’ll contact you to verify if the charge is legitimate. Purchases you make with your Sunova Business Cash Back Mastercard receive 90 days of purchase protection, up to a maximum of $50,000 per account each year. Those purchases also qualify for double the manufacturer’s warranty, for a maximum of one additional year! 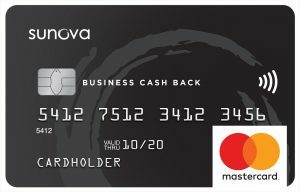 Ready to get the Sunova Business Cash Back Mastercard? Click the link below to apply now. 1Read the Rewards Terms & Conditions for complete details. 2Read the Insurance Certificate for complete details of coverage. Sunova Mastercard rates, fees, and terms and conditions. The Sunova Mastercard is issued by Collabria Financial Services Inc. in a joint partnership with Sunova Credit Union Limited pursuant to a license from Mastercard International Incorporated. Mastercard and the Mastercard Brand Mark are registered trademarks of Mastercard International Incorporated.